Iranian Foreign Minister Ali Akbar Salehi is due in Moscow for two days of talks with Russian counterparts, likely to include civil nuclear cooperation as well as the upcoming talks on Iran’s nuclear activity in Kazakhstan. Salehi may have the opportunity to meet with Russian Foreign Minister Sergey Lavrov, although Lavrov is due today in Algeria for talks with his counterpart Mourad Medelci. Further pre-trial hearings in the case of alleged 9/11 mastermind Khalid Sheikh Mohammed and his four co-defendants resume on Monday and continue all week at Guantanamo Bay in Cuba. At the last session, held at the end of January, it emerged that proceedings were being censored by figures outside the courtroom. The judge overseeing proceedings, Colonel James Pohl, subsequently ordered the release of the transcript of the censored section of proceedings. Finally, Egypt marks the second anniversary of Hosni Mubarak stepping down as President following unprecedented protests in the Arab world’s most populous state. Two years on, the turmoil in Egypt continues with little prospect of an end in sight. On Tuesday, all eyes will turn to the United States, when President Barack Obama delivers his State of the Union address. Of note too is the fact that this year the Republican response will be delivered by Florida Senator Marco Rubio, described on a recent Time magazine cover as the ‘saviour’ of the GOP. Also in the US, UN High Commissioner for Human Rights Navi Pillay will address a Security Council meeting on the protection of civilians in armed conflict, where she is likely to highlight the plight of Syrians. 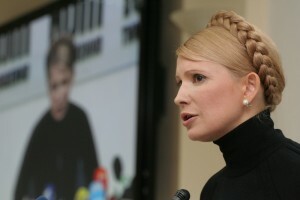 Former Ukrainian Prime Minister, Yulia Tymoshenko, is scheduled to appear in court again in Kiev on charges of embezzlement and tax evasion. Supporters suggest the charges are politically motivated, a suspicion reinforced by recent suggestions she may also face murder charges over the 1996 killing of Yevhen Shcherban. Finally, France’s National Assembly is due to begin consideration of a banking reform bill, which would increase oversight of banks and aims to curb risky trading activities. Critics argue the proposed reforms concede too much to banks and fall short of lofty campaign rhetoric about getting tough on banks. On Wednesday, it is EU High Representative Catherine Ashton’s turn to address the UN Security Council at a session discussing cooperation with the EU. She may well discuss the upcoming talks on Iran’s nuclear programme, now scheduled for 26 February in frosty Almaty, Kazakhstan. In Moscow, meanwhile, the head of the state-run arms exporter Rosoboronexport, Anatoly Isaykinis, is scheduled to hold a press briefing at Russia’s Foreign Ministry. He may face questions on Russian arms sales to Syria. Finally, Turkey’s European Affairs Minister Egemen Bagis will be in London addressing a RUSI/Open Europe discussion. South Africa’s President Jacob Zuma will on Thursday give his State of the Nation address. It follows a tumultuous year for Africa’s economic powerhouse, marred in particular by the Marikana mine massacre last August in which a total of 44 people were killed during labour protests at the Lonmin-run platinum mine. 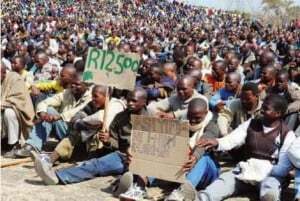 The massacre sparked a significant uptick in industrial unrest across South Africa. Also on Thursday, a slew of interesting economic data is scheduled to be released. Highlights include fourth quarter GDP data for Germany, Japan, Italy and Greece, as well as a flash estimate for the whole EU area. 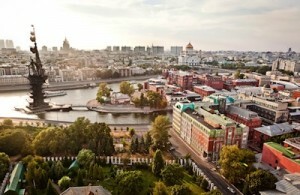 On Friday, Russia will host G20 finance ministers and central bankers for a meeting in Moscow, attended by IMF Managing Director Christine Lagarde. In the US, President Barack Obama will hold talks with Italian President Giorgio Napolitano, where they are likely to discuss the upcoming Italian elections, scheduled for 24-5 February. At the moment, it seems likely Italy’s next premier will be Pier Luigi Bersani, of the centre-left Partido Democratico. 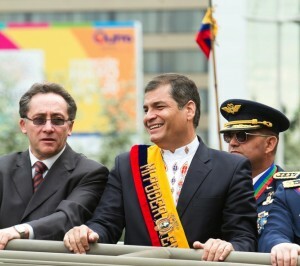 On Sunday, Ecuadorians will vote in legislative and presidential elections. According to the latest polls, incumbent leftist President Rafael Correa looks set to be re-elected. Voting also takes place in Cyprus, where eleven candidates are seeking to replace President Demetris Christofias. If no clear winner emerges, a run-off will take place on 24 February. Cyprus is seeking a bailout from the EU and IMF, however this is highly unlikely to be finalised until after the elections. Lastly, environmentalists are scheduled to hold a major rally in Washington DC. Particularly focused on opposition to the proposed Keystone XL pipeline which would transport Canadian oil, including oil gleaned from controversial tar sands, into the US.